November 3rd 2018. Peacefully at Mullaghboy Nursing Home. Dearly loved husband of Helen, father of Joan, Helen, Jackie, Valerie and Colin, father-in-law of George, Desy, Rae, Howard and Judith. Grandfather of thirteen and great-grandfather of nineteen. Service of Thanksgiving in Ballygrainey Presbyterian Church on Thursday at 1.00 p.m.
Family flowers only please. 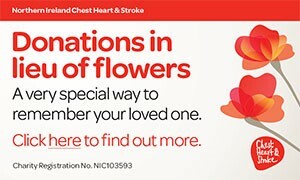 Donations may be sent if desired to NI Chest Heart & Stroke c/o S. Clarke & Son, Funeral Directors, 64 Newtownards Road, Bangor, BT20 4DR. Will be sadly missed by the entire family circle both at home and abroad. Family flowers only please. Donations may be sent if desired to NI Chest Heart & Stroke c/o S. Clarke & Son, Funeral Directors, 64 Newtownards Road, Bangor, BT20 4DR. I am sorry to tell you that John A. MOORE has passed away.